For the first time in history this magazine has a Jaguar in it and it’s not because we’ve gone soft. 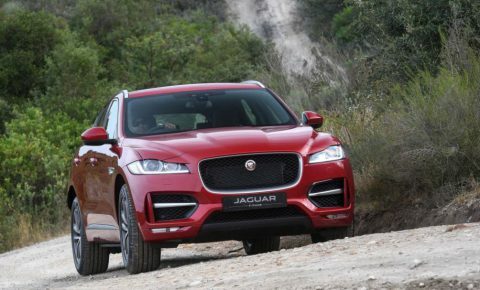 Jaguar has gone big and built and SUV. At this point you might be wondering why and rightly so. What business does Jag have building SUVs? We already have a few of those to choose from last time we checked. They’re called Land Rovers and they’re pretty fantastic across the board. The F Pace project probably could have been finished much sooner if it simply borrowed an existing Land Rover platform and bolted a Jag body on top. It would have been a fast, simple, cost effective if not very Jaguary route to follow. Sure, it would have looked like a Jag, but it would have felt like a Land Rover. It would have been disrespectful, profane almost. Fortunately, that’s not what happened. Jaguar remained (mostly) true to its heritage and built an SUV that doesn’t feel like any other SUV we’ve driven before. We usually reserve comments on design for artsy crossovers and crossover coupés, but one can’t talk Jaguar without making remarks on the styling. 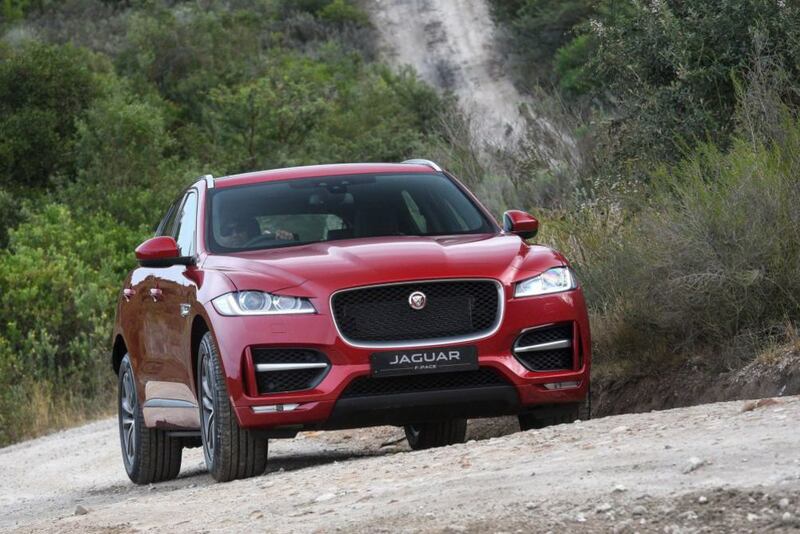 The head designer, Ian Callum, wanted the F Pace to be distinguishable, even when viewed from a great distance. On that front his team gets top marks, because there’s no mistaking this SUV for anything else on the road. In terms of overall styling it scores high as well. It’s sexier and more coupé-like than most of the so-called SUV coupés out there, even though the “C” word wasn’t uttered once during the two-day launch. The level of aggression depends on how you specify it. In a light colour and on standard wheels it comes across as elegant, majestic and agreeable. Give it a lick of dark paint and a set of black 22-inch alloys, however, and it is converted into something that you wouldn’t be able to use for the school run. Mostly because it was still recovering from a babbie after a long night of drinking and bar fighting. What about luxury, old chap? Quite, quite. 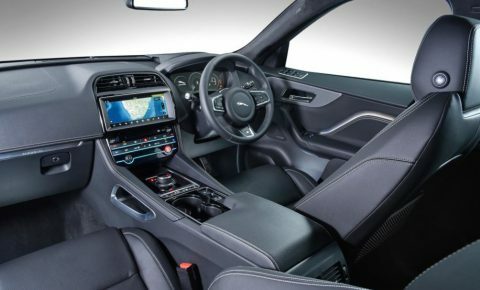 One can’t have a Jaguar without a posh interior and the F Pace has more than enough luxury to differentiate it from the humdrum personal transport devices the peasants use. This includes a mix of old and new. 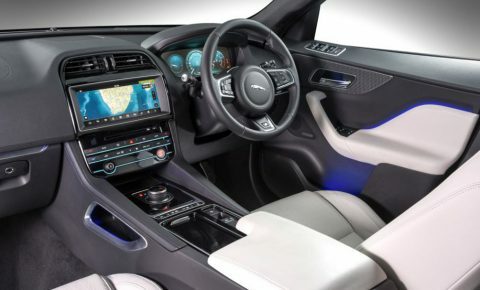 The old is deftly represented by leather, suede and expensive plastic as you’d expect, while the new relies on a host of tech, most of it optional, to present the Jag’s case. 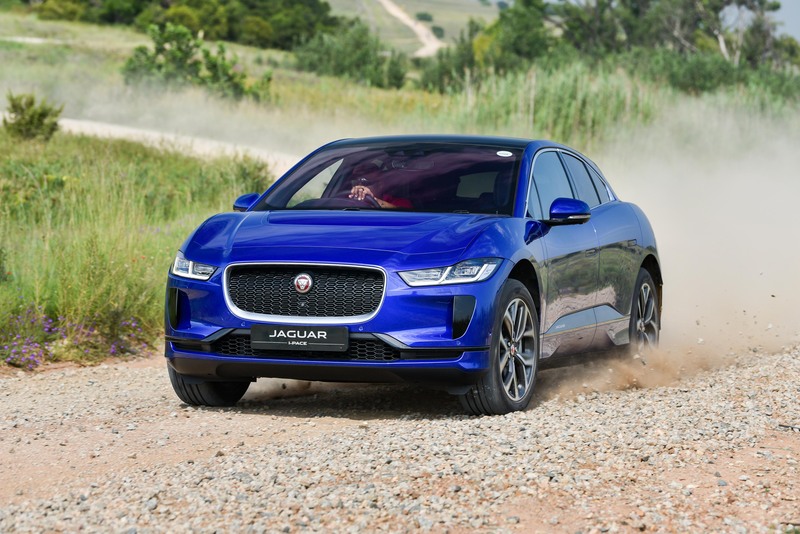 This includes a wonderfully intuitive touch screen, digital instrument cluster, an F Pace smartphone app for remote starting and something called an Activity Key. This key is basically a waterproof and shockproof wristband with an integrated transponder. You simply place the actual key inside the vehicle, rub the wristband on the “J” and the car locks itself. The Jag won’t start unless you rub up against the “J” again, even if a thief somehow manages to get hold of the key on the inside. We wouldn’t recommend any hobbies where your arms are at risk, however. We’ll end this segment by stating that there’s opulence aplenty on the inside. 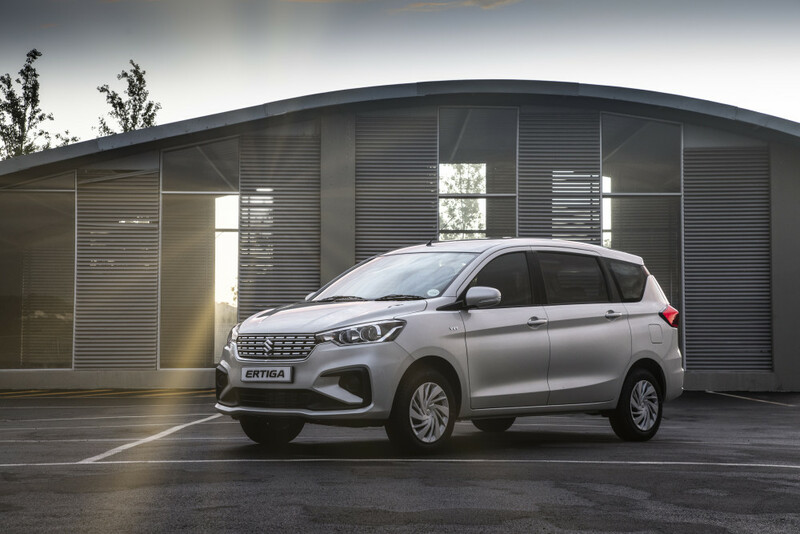 This will be explored extensively in an upcoming road test, but for now we’d like to focus on two important things we learned at the launch. 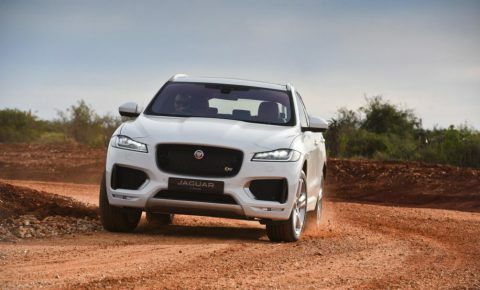 When it comes to off-roading, the Jaguar is suitably equipped. It’s not a Land Rover, but it doesn’t have to be as nearly 100% of its owners will only leave the tarmac once in a blue moon. 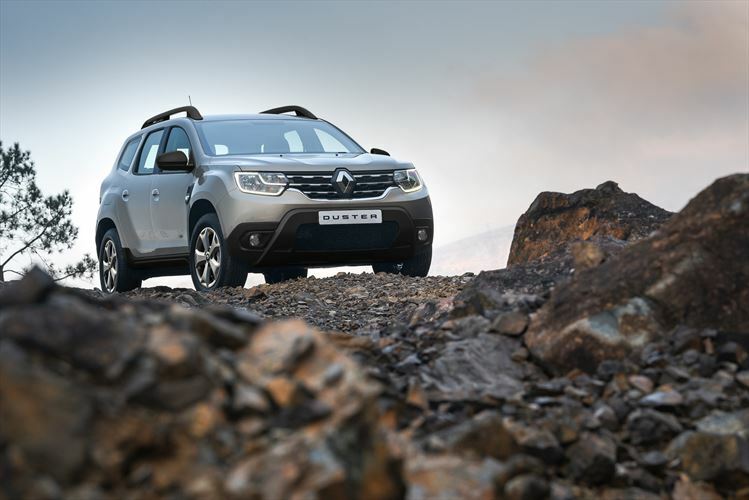 These rare off-road excursions will perish in the face of something called Adaptive Surface Response, which is like Land Rover’s Terrain Response, but smarter. In a Landy you have to tell it what kind of surface it’s driving on, but the F Pace just knows. It immediately adapts to said surface and applies every trick in the book to keep itself going. We’ve seen this kind of witchcraft before in high-end vehicles, but this is the first time that a simple traction demonstration has left us all swivel-eyed and open-mouthed in astonishment. With the car parked at an incline, with three of its wheels on rollers, we engage the Low-Friction Launch. This function uses a progressive throttle map, which makes it easier to pull away on a low-friction surface from a dead stop. It takes some effort, but the car eventually pulls away using only the left front wheel. A spectacular result, obviously mostly down to our educated throttle inputs. Afraid not, old chap. This car does an even better job when you hand over the throttle and brake duties to it. 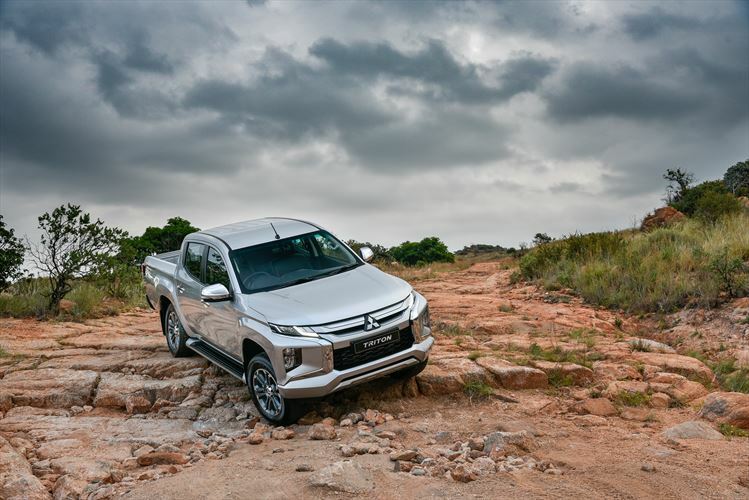 It has All Surface Progress Control, which is a fancy title for what is essentially off-road cruise control. It takes care of everything but steering and it’s simply astonishing to see how much better it does than any human present on the day. With a homo sapien using the Low Friction Launch system, the Jag still takes a good few seconds to find the necessary grip to move forward, whereas All Surface Progress Control saw it move forward from the moment the driver let go of the brake pedal. Yes, it takes some of the romance out of off-roading, but consider the car the system is fitted to. If one only intents to use the F Pace’s 4×4 ability occasionally, one is obviously not a keen off-roader, so why not have a car that takes all the effort out of it? That’s the biggest character difference between the Jaguar and its Land Rover cousins. The Landy still requires a decent amount of input from the driver while off-roading, so he/she still feels involved and accomplished when a goal is achieved. 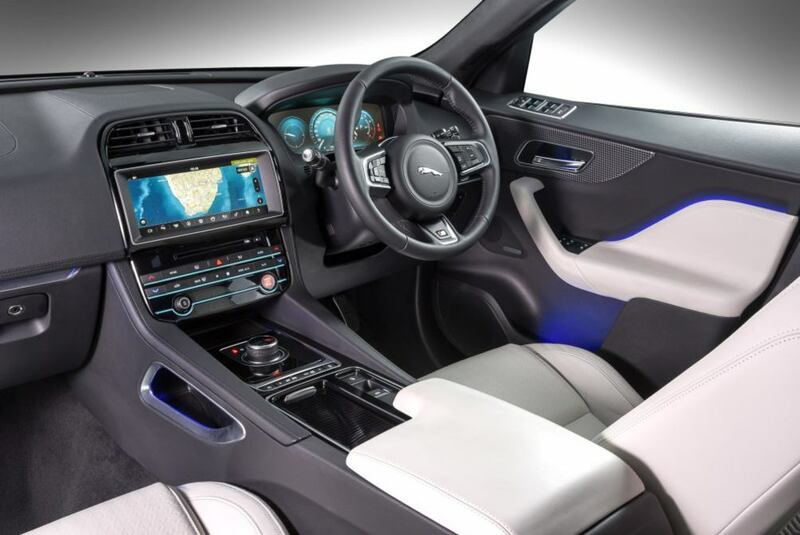 The Jag wants to make it as easy and as comfortable as possible. Vice versa when a proper driving road presents itself. 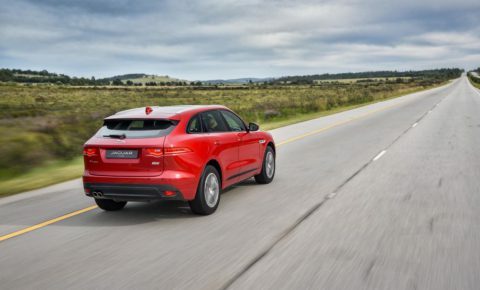 Fast Range Rovers are effortlessly fast as they take a lot of the thinking and manhandling out of the equation, whereas the F Pace wants to provide an engaging driving experience. It wants you to have fun behind the wheel, in fact, at times it feels as if its actively encouraging it. We catch our first glimpse of this inherent naughtiness on a gravel road on the first day. Braking into a corner, the rear steps out slightly, causing us to wonder whether we somehow managed to switch the traction control off by mistake. Negative. The Brit is more willing to play, which isn’t surprising considering the way it’s all-wheel drive system works. Most performance SUVs use the front wheels for motivation and steering, leaving the rear wheels playing a supporting act only if and when necessary. 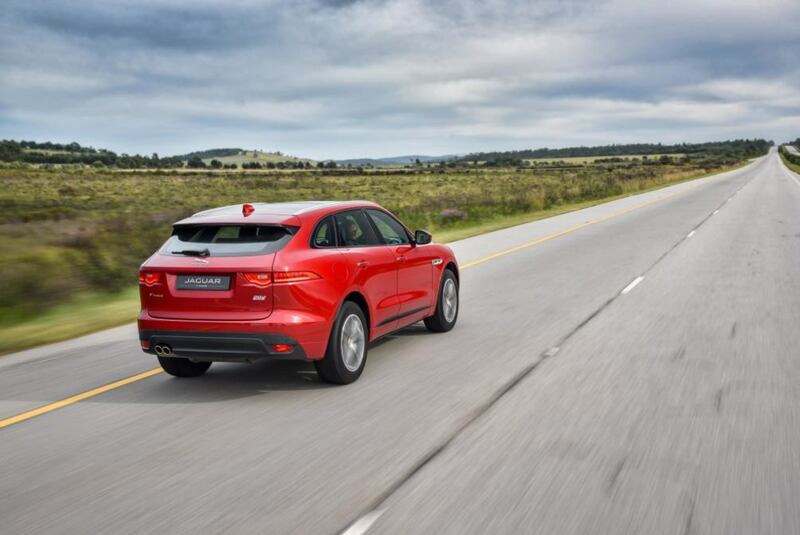 With the F Pace, it’s the other way round. 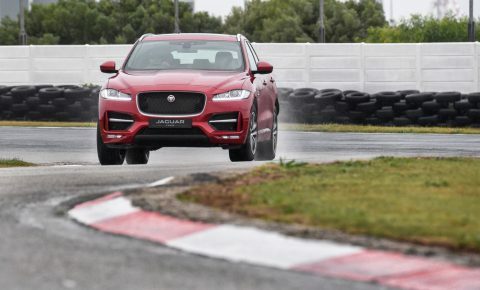 Yes folks, the F Pace is predominantly rear wheel drive. It can send up to 50% of its power to the front axle, but this very rarely happens. 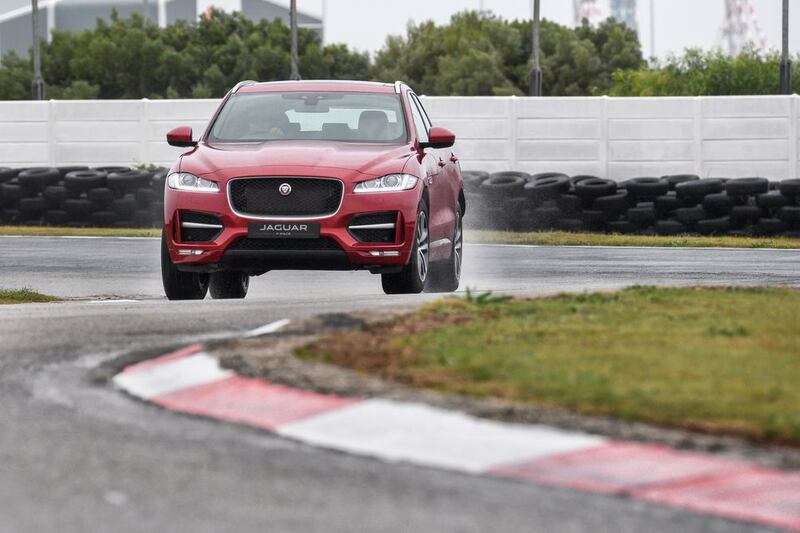 To explore its dynamic prowess, we were allowed to do a few hot laps on the Aldo Scribante circuit just outside Port Elizabeth. The 132kW/430Nm 2.0-litre diesel wasn’t available for this portion of the drive, but it doesn’t matter. 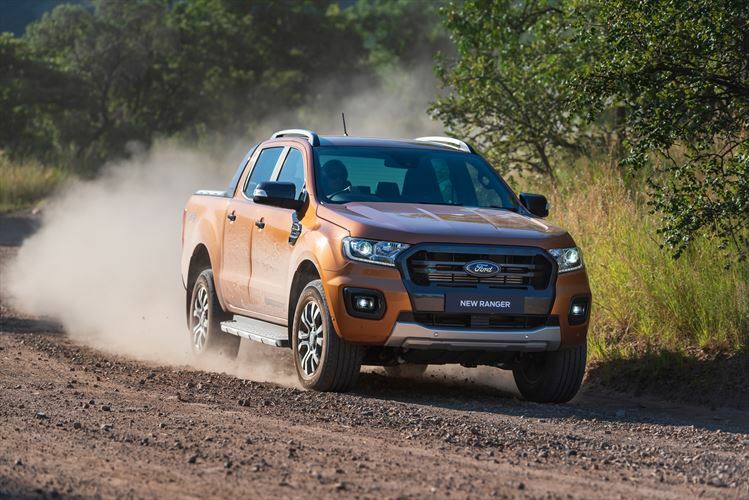 It has a few feathers in its cap – economy, mid range punch and a smooth eight-speed transmission, but outright performance isn’t one of them. For a proper kick in the rear, one would have to opt for one of the 3.0-litres. There are two supercharged petrol models and one turbodiesel. The petrol is available in with either 250kW or 280kW, but it’s the diesel that impresses most with its 221W and 700Nm. Don’t ignore the V6 petrol, however. The racket it makes is worth the extra cost in purchase price and fuel. The engines are only half the story. In addition to the impressive power figures, responsive eight speed automatic gearbox, torque vectoring and clever electronics, the Jag has the right hardware for huge amounts of fun. This includes a lightweight aluminium architecture, F Type derived suspension and electronically-controlled dampers. Yes, there are a few niggles. Considering the use of aluminium and using that as a bragging right, would it have been too much to expect an aluminium starter button and shift paddles? One of the models we drove already had a nasty scratch on the start button, which was a big let down on a car that costs as much as this. The second problem is price. It’s more or less on par with the Porsche Macan, but a lot more than the most expensive BMW X4 and upcoming Mercedes-Benz GLC Coupé. Yes. The Jag provides a lot of character, good looks, refinement and hooliganism. Basically, everything a Jag should be. Check out the video below to hear what the V6 petrol sounds like.